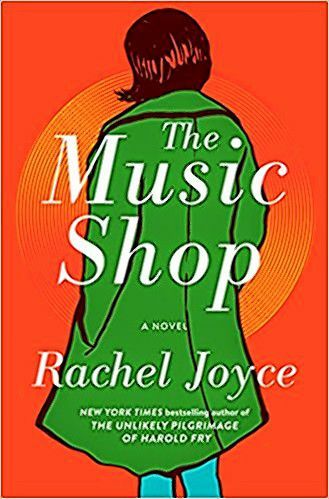 The Music Shop is located on a crumbling dead-end street, somewhere in England, in the 1980s. The owner is a large and lonely man named Frank, who will not carry CDs or cassette tapes in his shop – just vinyl. But he is open and caring and knowledgeable about every kind of music that was ever pressed onto vinyl. His gift is the ability to find the exact artist, album and track that can restore the spirits of each customer who walks into his shop. His life is changed forever when a woman faints outside his shop window, and he carries her in to recuperate. She opens her eyes and flees the shop almost at once, remaining a mystery to all the people in Frank’s little world: the owners of the other failing businesses on the street, his teenage shop assistant, the down and out regulars at the corner pub. She is known only as the mystery woman in the green coat, and though many theories are expounded, no one can explain her. Still, Ilsa returns to Frank’s music shop, and sets up “music lessons” so that he can teach her to listen to music. She and Frank each bear many secrets, which are slowly and carefully revealed. Their tentative relationship grows slowly and cautiously until Ilsa is called home to Germany, vinyl becomes more and more impossible to sell, and all seems lost for both Frank and Ilsa. Their separation is not the ending, though. What does happen to them is unlikely and joyful and heart-grippingly happy. It is sufficient to say that, if vinyl can make a comeback, perhaps Frank can, too.